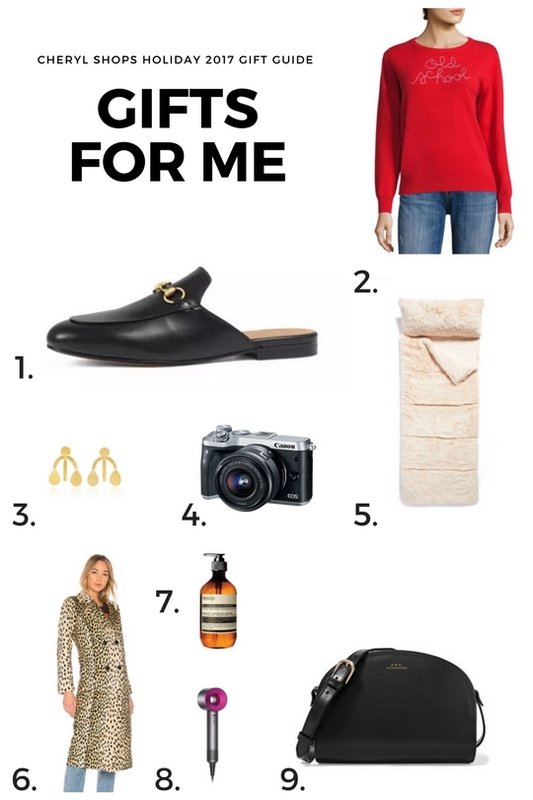 And now, onto the most fun gift guide of the holiday 2017 season: gifts for ME! (Hey, this is my blog, and I can dream if I want to!) Here's what I've been lusting after this year. Warning: most of these are on the splurgy side, but, Santa Baby, I've been an awful good girl. 1. I thought I wanted a pair of Gucci Marmont loafers until I saw a coworker with these. Now they're the only shoes I can think about. Gucci is THE It label right now, but these will live forever. 2. Lingua Franca's cashmere sweaters are like the Gen X version of those T-shirts that say "Rosé all day." Some of their slogans are a bit silly (like the ones that say "Original Gangster") but "Old School"—and the bright red color—suits me just fine. 3. These earrings have inspired a thousand knockoffs (including, um, the ones I featured in my gifts for women guide), and yet all I want is the real thing. 5. I live in an old Victorian, and my apartment gets incredibly cold and drafty in the winter. This faux-fur sleeping bag looks like the perfect solution, although I fear I'd be so warm and cozy, I'd never get up from the couch. 6. I've been looking for a leopard-print coat forever; I have a vintage one that I love, but it's falling apart. I am really particular about leopard prints, and although this one is not quite right—it's faux fur, and I'd prefer a natural woven fabric—it's pretty darn close. 7. I once bought this hand soap without checking the price, and I was too embarrassed to say anything, so I brought it home anyway. It literally changed my life—it's the only hand soap I've ever used that has not dried out my hands. The price is fairly ridiculous and yet somehow worth it. 8. Speaking of ridiculous, does anyone really need a $400 hair dryer? Like, is this really better than a Babybliss or a Hot Tools? With its featherweight construction, near-silent fan, and shortened drying time, all reviews point to yes. 9. I am so methodical about my handbags, it usually takes me close to a year to make a decision. (I am a little OCD, I know.) I have been eyeing this one all year, and after seeing it on one of my favorite fashion bloggers, I think my decision has finally been made. Coming next week: a last-minute gift guide for all the procrastinators out there! fun picks! I am liking that leopard print coat! I've been curious about that Dyson hair dryer. The price is really steep tho, ouch!! That leopard coat is a beauty!